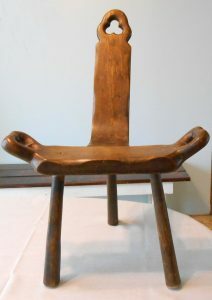 This unique antique birthing chair from the past would be sat in while the woman was giving birth. Clover shaped handles to hold on to. Some scratches (look at photos). 26 1/2 inches high x 19 inches wide. 1 to 1 1/2 inches thick. 12 1/2 inches from floor of top of seat. wood on seat and back. Great conversation / display piece.